Shore Cliff Hotel is Pismo Beach newest hotel located blocks away from the Pismo Pier and downtown Pismo Beach. 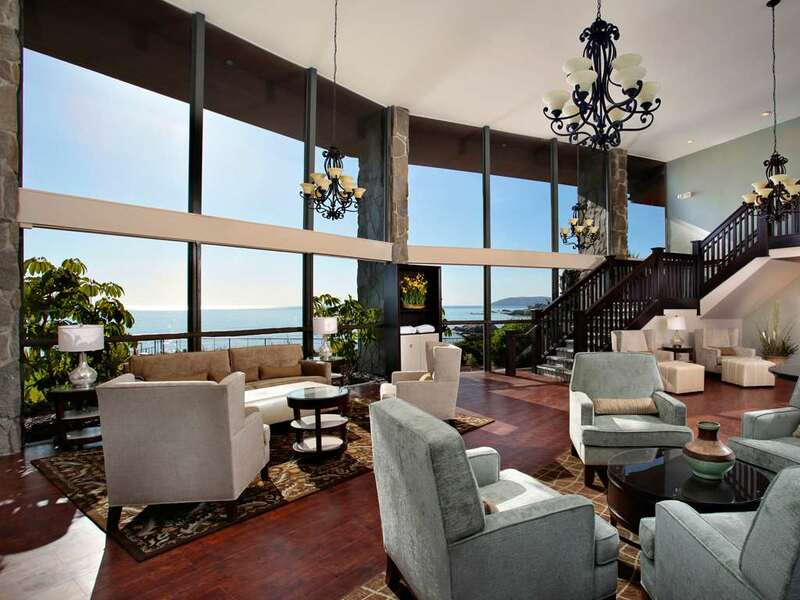 Recently renovated in 2016 this Pismo Beach hotel is perched on a 90-foot cliff above the Pacific Ocean and every room has a view with a private patio or balcony. Ventana Grill: Restaurant perched on a coastal bluff specializing in Latin-inspired dishes and fresh seafood. Rosa Italian Restaurant: Rosa Italian Restaurant is known for its award winning recipes classical Italian dishes and highly acclaimed specialties such as cioppino. A family owned and operated establishment Rosa boasts fine dining in a relaxed atmosphere. An extensive wine list and full bar await for your arrival. Shore Cliff Hotel is located halfway between Los Angeles and San Francisco in the beautiful Pismo Beach. Dinosaur Caves Park11-acre oceanfront bluff top park with child play area restrooms wedding overlook and an amphitheater for entertainment events. Edna Valley Wine RegionThe Edna Valley Wine Region is home to more than 200 wine tasting opportunities. Hearst CastleHearst Castle is a National Historic Landmark and California Historical Landmark mansion located in San Simeon on the Central Coast of California. Monarch Butterfly GroveEach year thousands of vibrant orange and black Monarch Butterflies flock to Pismo Beach seeking shelter from the freezing northern winters. From late October to February the butterflies cluster in the limbs of a grove of Eucalyptus trees at Pismo. Montana de OroMontana de Oro features rugged cliffs secluded sandy beaches coastal plains steams canyons hills hiking and biking trails. Oceano Dunes SVRAOceano Dunes is the only California State Park where vehicles may be driven on the beach. Pismo Beach PierA 60-acre regional beach pier and promenade. Public restrooms sand showers volleyball courts children play equipment benches restaurants shopping and more. Downtown San Luis ObispoOne of the best main streets in the nation offering some of the most unique eclectic and distinctive shopping on the Central Coast. Pismo Beach Premium OutletsThe world finest outlet shopping. Save everyday on designer and name brands including Coach Gap Outlet Nike Polo Ralph Lauren and More. California Polytechnic State UniversityPublic University located in San Luis Obispo CA.